College Football began on August 26 with Hawaii and California playing in Sydney, Australia. That game was followed up by the five time defending FCS Champions North Dakota State surviving an overtime game against Charleston Southern. The season begins in full force on Thursday, September 1 with sixteen games. Many of the top matchups are getting most of the press and rightfully so. LSU versus Wisconsin, USC versus Alabama, Notre Dame at Texas, Ole Miss versus Florida State, Georgia versus North Carolina, Clemson at Auburn, and Oklahoma versus Houston are all tantalizing on paper. All of those games will be fun to watch, but let’s take at some of the games that may not be on the radar. Note, these games are listed in order of when they will be played. 1. South Carolina at Vanderbilt (9/1 at 8 PM EST) – This probably does not strike as much, but it could be a game that determines if one of these schools reaches a bowl game in 2016. This will be Will Muschamp’s first game at South Carolina and he inherits just nine returning starters (four on offense and five on defense). It will be interesting to see if Vanderbilt’s offense can improve from 2015 and the impact Muschamp has on the South Carolina team. 2. Kansas State at Stanford (9/2 at 9 PM EST) – A Friday night game at the Farm featuring Heisman hopeful Christian McCaffrey against a formidable Bill Snyder coached Kansas State defense is worth watching. 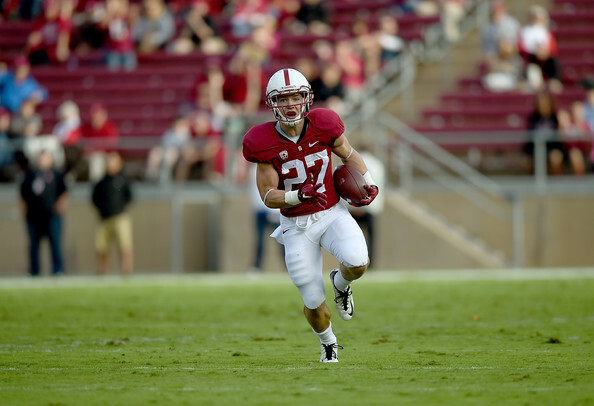 Heck, just a chance to see McCaffrey in action is a game worth watching. Can the K-State defense keep McCaffrey somewhat in check? How will Stanford’s new quarterback play? Can K-State keep the game close and provide some worry to the Stanford fans? There are a lot of things that will be interesting to keep track of in this one. 3. Western Michigan at Northwestern (9/3 at 12 PM EST) – Western Michigan is a team that could make some serious noise in the MAC West in 2016. A game against a team like Northwestern will be a very good measuring stick. The Broncos have offensive weapons like quarterback Zach Terrell (3,510 yards with 67% completions as well as 29 touchdowns and 9 interceptions), Jamauri Bogan (1,051 yards rushing and 16 touchdowns), Jarvion Franklin (735 yards rushing and five touchdowns), and receiver Corey Davis (90 catches for 1,436 yards and 12 touchdowns). Meanwhile, how Clayton Thorson progressed for the Northwestern offense is a big question because they cannot rely solely on Justin Jackson (1,418 yards rushing and 5 touchdowns). 4. Missouri at West Virginia (9/3 at 12 PM EST) – Missouri had one of the top defenses from last year (gave up 16.2 points and 302 yards per game) while West Virginia averaged 34 points and 480 yards per game. The contrasting styles and how each team can effectively make adjustments will be exciting to see. 5. UCLA at Texas A&M (9/3 at 3:30 PM EST) – UCLA is coming off an 8-5 season and is considered one of the favorites for the Pac-12 and Pac-12 Title. They are led by sophomore Josh Rosen (3,668 yards with 23 touchdowns and 11 interceptions) and have nine starters back on defense. Kevin Sumlin may be under the microscope more than usual this year after back-to-back 8-5 seasons. Two former Sooners will be in the back for the Aggies as Trevor Knight and Keith Ford. The Aggies will also have back the top five receivers from 2015 and this could be a fun game to watch if the offenses explode. 6. BYU versus Arizona (9/3 at 10:30 PM EST) – BYU may appear on this list quite often given their schedule. Taysom Hill is back for yet another season and he goes up against an Arizona team that went 7-6 last year and returns 15 starters. This game will also be Kalani Sitake’s first game in charge of BYU after 11 years of Bronco Mendenhall. This game will be a fun one to watch between Arizona’s Anu Solomon and Hill. 7. FCS Teams versus FBS Teams – These matchups are always worth keeping an eye on because they can produce some shocking results (see Portland State winning not once, but twice in 2015 against FCS teams). It is always great to see the FCS teams holding a late lead and see if they can complete the upset. Check back next week for under the radar games for week two. The final eight teams in the 2016 NCAA Division 1 Softball season will be playing for the chance to win the Women’s College World Series with an updated bracket here. Each game of the 2016 Women’s College World Series will take place from ASA Hall of Fame Stadium in Oklahoma City, Oklahoma. The 8 teams will compete in a double elimination format until only two teams are left. Those two remaining teams will then play in a best of three championship series to determine the National Champion. The two-time defending National Champions, the Florida Gators, were knocked out in the Super Regional round by Georgia so there will be a new Champion crowned in 2016. All of the schools in the 2016 WCWS have previously been to the Women’s College World Series. Results for the Regional round can be found here while the Super Regional results can be found here. Returning from the 2015 WCWS are Michigan, Auburn, LSU, Alabama, and UCLA. Below are the eight teams that made the 2016 Women’s College World Series. The Women’s College World Series will get underway on Thursday, June 2 with four games scheduled for the opening day. The entire schedule can be found in the table below with the Championship Series located in a separate table. The tables below will be updated with final scores as the games go final each day. 6/2/2016 Update: The final two games scheduled for Thursday, June 2 were postponed to Friday due to weather. If games 13 and/or 14 are needed to be played, they will take place on Monday, June 6, pushing back the start to the Championship Series to Tuesday, June 7. If games 13 and/or 14 are not needed, the Championship Series will begin on Monday, June 6 as scheduled. Elimination Saturday comprised four games that would cut the field in a half from eight teams to four teams. It was an exciting day that sets up Sunday to determine the two teams that will contest the Championship Series starting on Monday. An updated schedule of games can be found here while recaps of the games on Thursday are here and Friday are here. A close game between SEC foes Tennessee and Auburn saw the Tigers come out on top with a 4-2 win. Auburn will be back on the field again on Saturday needing to win a second game to stave off elimination. Auburn started a two out rally with a walk drawn by Kasey Cooper and single to left field by Branndi Melero, but a ground out ended the rally in the top of the first. The Volunteers also had a two out rally of their own in the bottom of the first. A single past the shortstop by Megan Geer was followed by a single from Annie Aldrete to put runners on the corners. A pop out in shallow left field also left Tennessee without any runs. The top of the second produced an even better chance for Auburn. Haley Fagan led off with a single and Carlee Wallace did the same. A sacrifice bunt moved the runners up to second and third, but like the first inning, the Tigers could not capitalize. Tennessee also had a great opportunity to put up the first runs of the game. A one out double by Rainey Gaffin was followed up with a walk and single to load the bases. A line out by Meghan Gregg to short allowed a double play to occur as Tory Lewis was too far off the base and thrown out at first. After two innings, the game was still scoreless. The top of the third was a similar story for Auburn, but a different ending this time. Cooper drew a one out walk and moved up to second on a ground out by Melero. Morgan Estell hit an infield single and then stole second to put runners on second and third. A little dribbler off the end of the bat by Fagan was perfectly placed with the infield back and the Tigers took a 1-0 lead. The Tigers continue to build their lead with a double by Wallace to the right center field wall to clear the bases. At this point, Tennessee’s Erin Gabriel was removed from the pitching circle for Cheyanne Tarango with Auburn leading 3-0. Auburn added another run with Jade Rhodes hitting a pop fly down the left field line that could not be caught by Shaliyah Geathers despite it being in her glove. Wallace scored to make it 4-0, which is the lead the Tigers took after the top of the third. Tennessee was finally able to put their first run on the board in the bottom of the fourth. Scarlet McSwain started with a lead off single while a ground out two batters later saw he thrown out at second, but Gaffin reach base. Geathers then hit a double that reached the left center field wall to bring home Gaffin while the Vols trailed 4-1 after four innings. The Tigers had a chance to rebuild their lead to four runs with runners on first and second with two outs, but the Volunteers did not give up a run by forcing a ground out to end the threat. The Vols had a chance to cut into their deficit in the bottom of the fifth and did so. Gregg reached on a funky hop over the pitcher’s glove while Lexi Overstreet singled to right field. Geer hit into a double play with a line out to right field while Overstreet was doubled up at first on an overzealous base running trip. A single by Aldrete and hit by pitch from McSwain loaded the bases with two outs. After going to a full count, Tarango was able to hit an opposite field single to right field to score Gregg to make it a 4-2 game. Auburn decided to replace Lexi Davis in the circle with Rachael Walters who was able to get the last out of the inning with a fly out to left field by Gaffin. A formful sixth inning set up a tense finish between the Tigers and Volunteers in the bottom of the seventh with Auburn holding a 4-2 lead. Overstreet struck out to start the bottom half of the inning while an error by at second base by Emily Carosone allowed Megan Geer to reach first base. It was just the third error by Carosone all season. Walters was able to get Aldrete to chase a rise ball for a strike out and out number two. Walters then struck out McSwain to end the game and keep Auburn alive. Tennessee was eliminated with the loss. The win against Tennessee was Auburn’s first Women’s College World Series win in program history. They will be back on the field again on Saturday with a game against UCLA at 7 PM Eastern Time. The Alabama Crimson Tide survived to play another game on Saturday with a tight 2-1 victory over Oregon. Alexis Osorio threw a complete game three hitter for the Tide. In the bottom of the first, Alabama got a one out walk from Haylie McCleney and she then stole second. A strike out by Jadyn Spencer and deep fly out to the warning track by Chaunsey Bell left McCleney stranded. The Tide were in better position to score in the bottom of the second. A one out single by Danae Hays was followed by a double off the right center field wall from Daniell Richard, however, the runners were stopped at second and third. Cheridan Hawkins struck out Leona Lafaele, but a flare single into right field by Chandler Dare brought home both runners for a 2-0 Alabama lead after two innings. Oregon was able to cut the deficit in half to 2-1 in the top of the third inning. Lauren Lindvall drew a one out walk while a ground ball moved her up to second. A single from Janie Takeda drove Lindvall home for a 2-1 game after two and a half innings of play. The Ducks had a chance in the top of the fourth to tie the game. Jenna Lilley started with single to right center field and she was sacrificed to second by Hailey Decker. A strike out, walk, and hit by pitch loaded the bases for Oregon with two down, however, Lindvall grounded out to second to end the inning. Oregon’s Janie Takeda bunted to reach base in the top of the fifth, but was thrown out trying to steal second and the Ducks could not continue the rally. In the bottom of the fifth, Dare had a one out double over the right fielder to put Alabama in position to score a crucial insurance run. Dare would be run down after a ground ball back to Hawkins while Demi Turner was able to get all the way to second. After intentionally walking McCleney to put runners on first and second, Hawkins was able to strike out Jadyn Spencer to keep the game at 2-1 in favor of Alabama. Both teams went down in order in the sixth inning to set the stage for a last chance in the top of the seventh for Oregon. The Ducks would provide an anticlimactic finish with a pop out and two strikeouts to end the game. Alexis Osorio ended up going the distance giving up only one run, three hits, and two walks, but struck out nine Oregon batters in the win. Oregon has been eliminated from the Women’s College World Series while Alabama will play LSU on Saturday night after UCLA versus Auburn. The game of the tournament thus far was wild from start to finish. Both teams had plenty of action while UCLA blew a five run lead in the third inning and Auburn blew a two run lead in the top of the seventh. In the end, Auburn won 11-10 on a walk off walk of all plays. (The box score is worth checking out and is linked at the end of the previous sentence). UCLA’s top of the first began with a hard hit to right center field by Delaney Spaulding that went to the warning track, but the ball was caught. After a bunt out, Ally Carda hit a soft single to right center field while Stephany LaRosa hit a two out double to right field to put runners on second and third. A check swing by Mysha Sataraka led to a Carda being thrown out at home to keep the game scoreless after half an inning. The bottom of the first gave Auburn a chance to take the lead with a two out rally. Back-to-back walks ended up not leading to anything more as a fly out ended the first inning with no score in the game. In the top of the second, UCLA was able to get runners on first and second with one out after an error by Auburn’s Kasey Cooper and a single to shortstop. Once again, the Bruins could not take advantage as a foul out and ground out ended the top of the second. The Bruins finally got on the board in the top of the third. A lead off walk by Allexis Bennett turned into a runner on second after she stole second easily. Another walk drawn by Carda and a sacrifice bunt moved the runners up to second and third with only one out. Another walk to Sataraka loaded the bases while Auburn elected to take Lexi Davis out of the circle in favor of Rachael Walters. The first pitch to Gabrielle Maurice was crushed into the right center field gap for a bases clearing triple and a 3-0 UCLA lead. After another walk, a bunt by Gracie Goulder was fielded and thrown back to home to get Maurice at the plate to keep it a 3-0 game. The Bruins added a fourth run with a single to right center by Kylee Perez that scored Maddy Jelenicki. The Tigers then made another pitching change with Marcy Harper coming in for Walters. One more run scored after a double steal of second and home (to go along with a blown call at second on the steal) to make it a 5-0 game after the top of the third. Auburn’s offense responded in the bottom of the third. A walk by Jenna Abbott and back-to-back singles from Tiffany Howard and Emily Carosone loaded the bases with no outs for the Tigers. Kasey Cooper drew a walk to bring home one run while Branndi Melero single to right field to make it a 5-2 UCLA. At this point, Ally Carda was taken out with Selina Ta’amilo stepping into the pitching circle. The first pitch by Ta’amilo was a wild pitch that allowed Carosone to score and the two runners to move up to second and third. The bases were loaded again after a four pitch walk to Morgan Estell with still no outs on the board. After a force out at home, Carlee Wallace cleared the bases with a double to left center field to give Auburn a 6-5 lead and still only one out in the bottom of the third. Ally Carda then re-entered the game after the double and her second pitch was well over the catcher’s head to move Wallace to third base. Wallace was thrown out at third on a ground ball from Jadyn Rhodes. Carda and UCLA finally got out of the third inning, but blew a five run lead and trailed 6-5. The Bruins were able to tie the game in the top of the fourth. A fielding error and bunt single followed a wild pitch put runners on second and third with one out. Sataraka hit a fly ball to left field that scored Bennett to knot the game up at six while Jelenicki flied out to end the inning. Auburn would reclaim the lead in the bottom of the fourth. A single by Emily Carosone and walk by Kasey Cooper set up Branddi Melero, who drilled a line drive over the left center field wall for a three run shot and a 9-6 lead. The Bruins continued to battle in the top of the fifth. A lead off single from Gabrielle Goulder was followed up with an infield single by Kylee Perez to put runners on with no outs. A single from Delaney Spaulding to right field scored Goulder as she slid into home to make it a 9-7 Auburn lead. Both runners also moved up to second and third with no outs on the board. Bennett struck out looking before Ally Carda drew a walk to load the bases. A foul out behind home plate from Stephany LaRosa and a nice jumping catch by Auburn’s Kasey Cooper at third kept the game at 9-7 after the top of the fifth. The Bruins had a two out rally in the top of the sixth with a walk by Goulder and single up the middle by Perez. A grounder through the infield by Spaulding loaded the bases, but a pop out to left field by Allexis Bennett ended the bases loaded threat. UCLA had one final chance in the top of the seventh and they made the most of it. Carda led off with a single and LaRosa singled back to the pitcher to put runners on first and second. A sacrifice moved them up one base before a ground out by Gabrielle Maurice scored Carda who slid around the tag to make it 9-8 with two down. Jelenicki came up and crushed a two run blast to left center for a shocking 10-9 lead in the top of the seventh. The Tigers still had a chance to come back and tie or win. Haley Fagan started with a lead off single back up the middle and Carlee Wallace crushed a ball into the gap in left field to score Fagan to tie the game at ten while Wallace was at second with no outs. Wallace was replaced by Victoria Draper. Jade Rhodes sacrificed Draper to third to set up Jenna Abbott, but she grounded to third with Draper caught in a run down and thrown out at third. Abbott was also thrown out on the play going for second in a bizarre ending to the seventh inning. In the top of the eighth, Perez led off with a single before a ground out and infield single from Bennett put runners on first and second with one out. Carda then flew out to center and LaRosa grounded straight to third base to set Auburn up with a chance to win the bottom of the inning. Carosone was hit in the helmet by a pitch, but was okay and took first base with one out and advanced to second on a wild pitch. A walk drawn by Melero put Morgan Estell in the batter’s box and she too was able to draw a walk to load the bases with two outs. Haley Fagan hit a deep shot to right field, but it was on the warning track for the third out of the inning and the two teams continued to play into the ninth inning. UCLA had another scoring chance in the top of the ninth. Gabrielle hit a one out double to left center field past the diving left fielder and she advanced to third on a passed ball. However, Jelenicki struck out and Goulder grounded out to first to keep the game at 10 apiece heading into the bottom of the ninth. Auburn’s Wallace drew a lead off walk, but was thrown out at second on a fielder’s choice. Strikeouts by Abbott and Howard sent the game into a tenth inning. Auburn had yet another chance to end the game in the bottom of the tenth. Carosone was walked on four pitches while Cooper singled to center field to put runners on first and second with no outs. Melero then flared a single to left field to load the bases, which brought up Morgan Estell. Estell drew a walk to give the Auburn Tigers the walk off win by a score of 11-10. UCLA has been eliminated from the 2015 Women’s College World Series and Auburn will face the Florida Gators on Sunday at 1 PM Eastern. Auburn will need to defeat Florida twice on Sunday to reach the Championship Series. The LSU Tigers held on for a 5-3 victory over rival Alabama on late Saturday evening and early Sunday morning. The Tigers have moved on to the semifinals of the Women’s College World Series with the victory. Alabama got on the board in the top of the first. Demi Turner drew a lead off walk and advanced to second on a wild pitch. She later advanced to third on a ground out and was able to score on a single to right field by Marisa Runyon. After the top of the first, Alabama held a 1-0 lead. LSU answered back in the bottom of the first. LSU had a runner on first after a single by Bailey Landry. She later stole second base with two outs and scored after a rope single to center field by Sahvanna Jaquish. Kellsi Kloss came up and hit a single between the left fielder, center fielder, and shortstop that scored Jaquish. However, Kloss was able to move to second and then scored after a bad throw to second base to make it a 3-1 LSU lead after the first inning. Alabama’s defensive problems continued in the bottom of the second. After Constance Quinn drew a lead off walk, she was able to advance to second after a bunt. A single by Emily Griggs was not fielded properly, but no error was charged to put runners on the corners with one out. A ground out by A.J. Andrews to first base allowed Griggs to move to second and Landry hit a two run single past the second baseman to bring the score up to 5-1 after two innings. The third and fourth innings were mostly uneventful. LSU got a lead off walk from Quinn, which led to Alabama’s Sydney Littlejohn being replaced by Leslie Jury as pitcher. Quinn tried to steal second, but was thrown out and LSU held a 5-1 lead after four innings. Alabama’s Andrea Hawkins reached first base after a fielding error at shortstop to start the top of the fifth. After back-to-back ground outs, Hawkins was on third, but could not be brought home after a fly out to right field ended the frame. LSU started with a lead off single from Andrews in the bottom of the fifth, but were set down in order after that. The Tide put together an excellent rally to start the top of the sixth. An error allowed Jadyn Spencer to reach first and Runyon hit a single to center field to put the first two runners on with no outs. Runyon was taken off the base paths for Rachel Bobo. LSU’s Allie Walljasper induced two fly outs to left field from the next two batters and a pop out to short to get out of the jam unscathed. LSU tried to put together a two out rally and increase the lead in the bottom of the sixth. Quinn hit a single up the middle while Dylan Supak drew a walk and was pinch ran for by Sydney Bourg. The Tigers would not be able to advance as Emily Griggs grounded out to third to end the inning. LSU led 5-1 heading to the top of the seventh. Alabama’s last chance in the top of the seventh started with a ground ball by Hawkins and she was able to leg out an infield single. Chandler Dare had the same result for the Tide to put runners, which led to Walljasper coming out and Carlee Hoover entering to try and close the game out. Hoover started with a strikeout of Demi Turner and a wild pitch allowed the runners to move up to second and third. Haylie McCleney drew a walk to load the bases while Jadyn Spencer hit a sacrifice fly to right field that scored Hawkins to make it a 5-2 deficit with two outs. Both runners also moved up to second and third while a wild pitch by Hoover allowed a run to score to make it 5-3, but Hoover forced a ground out to end the game. Alabama has been eliminated while LSU will face Michigan on Sunday at 3:30 PM Eastern Time. LSU will need to win twice against Michigan on Sunday to make the Championship Series. The 2015 Women’s College World Series got underway with four games played on Thursday night and into early Friday morning due to some severe weather in Oklahoma City. Each game is recapped below while a schedule for the upcoming games can be found here. The Florida Gators opened their defense of the National Championship with a 7-2 win over Tennessee on Thursday. Another complete game by Lauren Haeger lifted the Gators to the victory. The Gators started the scoring in the bottom of the first with a rocket to left field by Haeger to give them a 1-0 lead. Florida loaded the bases after a walk, single, and hit by pitch, but could not add to their lead. The Gators would have another chance to add to their lead in the bottom of the second. Following a walk and ground out, Kelsey Stewart singled to put runners on first and second with only one out. A grounder back to the pitcher advanced the runners and the Volunteers opted to load the bases by intentionally walking Haeger. Bailey Castro came up next, but could not capitalized as her strike out ended the rally. Florida did add to their lead in the bottom of the third. Following a strike out and walk, Kayli Kvistad came up and drilled a shot to right center field to put the Gators up 3-0. The three run lead would not last long, however. The Volunteers finally got their first runner on base in the top of the fourth following Shaliyah Geathers being hit by a pitch. A fly out brought Megan Geer up to the plate and she hit a two run shot to left field to make it a one run game again at 3-2. Florida would respond in the bottom of the fourth. After two quick outs, Haeger was able to single to left field and advanced to second on a wild pitch while Castro was hit by a pitch. Kirsti Merritt was able to hit a hard ground ball to second, but it was not fielded by Geer that allowed Haeger to score. Merritt then stole second and while sliding head first the ball went off her helmet allowing Castro to waltz home for a 5-2 Florida lead after four innings. The bottom of the sixth saw the Gators add more insurance runs. A lead off single from Stewart was followed by a ground out and Stewart was able to get to third on a stolen base. After Haeger was hit by a pitch (and pinch ran for by Jessica Damico), a throw by the catcher to third base went into left field that scored Stewart. Damico scored on a bunt back to the pitcher that was not fielded cleanly to make it 7-2. The Gators were able to load the bases, but could not score another run. It would not matter as the Volunteers went down in order to end the game in the top of the seventh. Haeger gave up only one hit (the two run homer by Geer) while striking out four batters and allowing no walks. Florida moves into the winner’s bracket and will face the winner of LSU and Auburn game on Friday at 7 PM Eastern Time. Tennessee will be playing the loser of LSU and Auburn on Saturday at 12 PM Eastern Time. 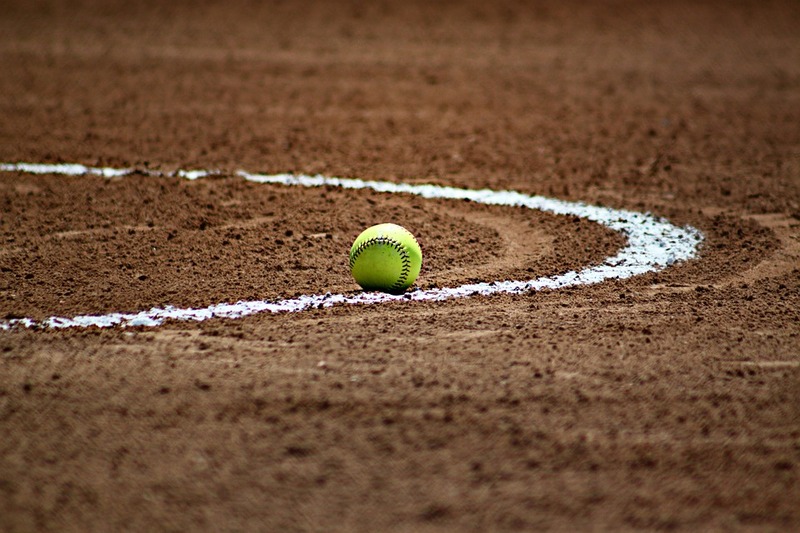 The LSU Tigers sound defeated fellow SEC rival Auburn 6-1 on Friday afternoon in the second game of the Women’s College World Series. LSU’s Carley Hoover gave up only one run in a complete game. LSU got on top first with a solo shot to left field by Bianka bell in the top half of the first inning. Auburn was unable to answer with LSU taking a 1-0 lead after one inning. In the top of the second, LSU Constance Quinn hit a bloop single to right field and an error fielding the ball put her on second. Sydney Bourg came up and struck out to end the rally. In the top of the third, Emily Griggs led off with a lead off single to left field before a double play with Auburn’s third baseman Kasey Cooper charging and catch a bunt then throwing down to first. LSU, however, would still come out with a bigger lead. A two out single by Bailey Landry and walk drawn by Bell put runners on first and second. Sahvanna Jaquish then delivered a ball into the right center field gap to drive home two runs on a double. Up next was Kellsi Kloss and she drove an 0-1 pitch to left off the foul pole. LSU led 5-0 after just two and a half innings of play. Auburn was in great position to score in the bottom of the third. Back-to-back singles put runners on first and second while a close ground out put runners on the corners. A fly out by Cooper ended the threat and Auburn was still looking for their first run of the game. LSU put runners on first and second in the top of the fourth following back-to-back singles, but were unable to take advantage of the opportunity. The bottom of the fourth saw a tremendous catch by A.J. Andrews in center field as LSU led 5-0 after four innings. In the bottom of the fifth, Auburn got a lead off double from Morgan Estell and she was sacrificed to third on a bunt by the next batter. Up next was Jenna Abbott who hit a sacrifice fly to center field to bring home Estell and make it a 5-1 deficit. LSU started the top of the sixth with a single from Quinn while Griggs singled two batters later. A ground ball by Andrews back to the pitcher was thrown over the third baseman’s head and Quinn was able to score. Griggs moved to third and Andrews, despite a stumbling out of the batter’s box, was able to move all the way to second. Auburn settled down to limit the damage to one run in the top of the sixth to trail 6-1. The bottom of the sixth began with a single by Emily Carosone and she advanced to third on back-to-back ground outs. She could not score after another ground out ended the inning and Auburn trailed 6-1 after six. Auburn had one last chance in the bottom of the seventh. H Fagan reached first base after LSU’s Sandra Simmons could not hold on to the ball. Estell then came up to hit a bunt single with her speed to put runners on first and second with no outs. Jade Rhodes then hit into a double play with a ground ball back to third base and she was thrown out at first. A strike out ended the game. Carley Hoover went the distance giving up only one run on six hits while striking out five Auburn Tigers. LSU will move to the winner’s bracket and face the defending National Champions, the Florida Gators on Friday at 7 PM Eastern Time. Auburn drops into the loser’s bracket and will face the Tennessee Volunteers on Saturday at 12 PM Eastern Time. The loser of that game will be eliminated while the winner will play a second game on Saturday. Another excellent pitching performance by Megan Betsa helped send the Michigan Wolverines to the winner’s bracket with a 5-0 win. She pitched a complete game shutout giving up only four hits and one walk while striking out six batters. The Wolverines struck first in the bottom of the first. Kelly Christner took an 0-2 pitch to right field with a line drive over the wall and a 1-0 Michigan lead. Neither team was able to get a runner on base in the second and third innings. Alabama got their second base runner and first hit in the top of the fourth, but that was the extent of that rally for the Tide. Michigan was able to load the bases in the bottom half of the fourth after a single by Sierra Romero, walk by Christner, and single by Kelsey Susalla. After battling back to get a full count, Lauren Sweet took a 3-2 pitch to right center field that just go over the fence for a grand slam and a 5-0 Michigan lead. Michigan was unable to add to the lead despite putting a runner in scoring position. Michigan had another chance to tack on runs in the bottom of the fifth after a walk by Romero, but she was thrown out trying to steal second. Christner then drew a walk and she successfully stole second, but Susalla’s strike out ended the inning. Alabama finally put together a serious threat in the top of the sixth. Demi Turner singled up the middle with one out and then tagged up to second base following a fly out. Jadyn Spencer singled to shortstop to put runners on first and second, the first time Alabama had a runner in scoring position in the game. The Wolverines got out of the jam by forcing a pop out from Marisa Runyon to end the top of the sixth still five runs to the good. The Tide were unable to get more than a runner on first and were shut out for the second time this season. The other game was against fellow WCWS participant Florida. Michigan moves to the winner’s bracket and will face either UCLA or Oregon on Friday evening. Alabama moves to the loser’s bracket to face the loser between UCLA and Oregon. UCLA upset the second seeded Oregon Ducks 7-1 on Friday night. UCLA’s Ally Carda pitched a complete game giving up one run on six hits with only one walk and three strike outs. Despite a steady rain in the first couple of innings, the game was played through the precipitation. Oregon had a great opportunity in the bottom of the first, but an uncharacteristic base running mistake hurt them. After a fielder’s choice got Janie Takeda on base, Jenna Lilley hit a single to right field, but Takeda hesitated rounding second and was thrown out at third. The Ducks would not score in the bottom of the first. The Bruins were able to get a couple of runs of Cheridan Hawkins in the top of the second. Stephany LaRosa hit a bomb to straightaway center field to lead off the inning. Gabrielle Maurice did the same, but to left field with two outs and UCLA led 2-0 after the top of the second. The game was delayed at the start of the top of the third with UCLA leading 2-0. A lightning strike in the area was the cause for the delay that lasted about 45 minutes. Delaney Spaulding hit a one out double in the top of the third and later advanced to third on a ground out, but Carda’s ground out ended the rally. Oregon had a chance to get on the board in the bottom of the third with a lead off runner getting on after an error. Nikki Udria was hit by a pitch to put runners on first and second, but Takeda lined out into a double play while Lilley lined out to end the inning. The Ducks threatened again in the bottom of the fourth back-to-back singles to open the frame put the Ducks in great scoring position. Carda settled down to get the next two batters out before another single loaded the bases. Yet another ground out ended the threat and UCLA held a 2-0 lead after four innings. A largely uneventful fifth inning gave way to the game changing sixth inning. With runners on second and third with two outs, Mysha Sataraka hit a pop fly to right field that could not be handled properly allowing both runners to score for a 4-0 lead. More defensive issues would haunt the the Ducks. Maurice struck out for the third out of the inning, but a wild pitch allowed her to make it to first to keep the inning alive. A single by Gracie Goulder brought home one run while Kylee Perez‘s single to right field brought home to more runs to make it 7-0. Oregon was able to get one run across in the bottom of the seventh after a lead off double from Koral Costa and a single by Lauren Lindvall scored Costa. A wild pitch allowed Lindvall to move to second, but Carda forced a foul out and then hit Udria with a pitch. Another pop out and another wild pitch moved the runners to second and third, but Carda was able to work out of the jam by forcing a pop out to end the game. UCLA will have a quick turnaround by taking on the Michigan Wolverines on Friday evening at 9:30 PM Eastern Time. Oregon will play on Saturday to keep their Championship hopes alive against Alabama at 2:30 PM Eastern Time. With the completion of the 2015 NCAA Division I Softball Tournament Super Regionals on Sunday, May 24, the 2015 Women’s College World Series is now set. There was not much in the way of upsets in the 2015 Tournament to this point as witnessed by the fact that the top 8 national seeds all made the 2015 WCWS. Only the Auburn Tigers are making their debut in the WCWS in 2015. In 2015, the Women’s College World Series will take place between Thursday, May 28 and Wednesday, June 3. The best of three Championship Series will take place on Monday, June 1, Tuesday, June 2, and Wednesday, June 3 (if necessary). 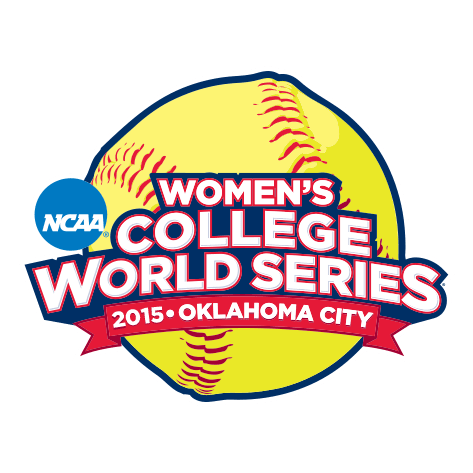 All the games in the 2015 Women’s College World Series at ASA Hall of Fame Stadium – OGE Energy Field in Oklahoma City, Oklahoma. Recaps of each day of action thus far in the tournament can be found here. The complete game schedule for the 2015 WCWS can be found below including which channel it will be shown on. Game 14: Only necessary if Game 12 is won by the Winner of Game 10 – 9:30 PM Eastern Time on ESPNU. Be sure to check back each day for recaps of all the games played. The Georgia State Panthers will face the Alabama Crimson Tide and Auburn Tigers in 2020 and 2021, respectively, according to FBSchedules.com. Georgia State is 0-3 against SEC schools. Georgia State will travel to Tuscaloosa and face Alabama on September 12, 2020. The two teams have faced each other twice before with games at Alabama. As expected, Alabama crushed Georgia State in both of those games. It was 63-7 in 2010 and 45-3 in 2013. The payday for the game at Alabama in 2020 will be $1.3 million for Georgia State. Alabama is 13-1 against Sun Belt schools with the lone loss coming to Louisiana-Monroe in 2007. Georgia State will also travel to face Auburn on September 25, 2021. The two schools have never played on the gridiron. Georgia State will receive $1.25 million for the game against the Tigers. Auburn is 22-0 against Sun Belt teams. Georgia State is a relative newcomer to football with their first season in 2010. In their first five seasons, the Panthers have compiled an overall record of 11-46. They have been part of the Sun Belt Conference since 2013, but have compiled a 1-23 record overall and 0-15 in conference play since 2013. 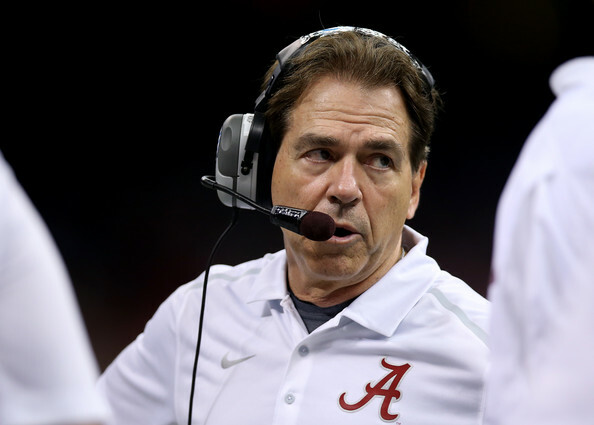 The offseason of trouble will not surrender for Alabama. On Friday, it was announced that running back Bo Scarbrough injured his knee, but the severity is not yet known. Scarbrough was hurt late in practice on Friday. 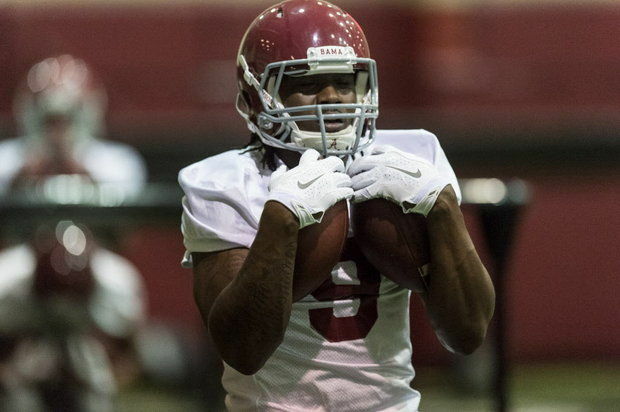 Scarbrough was expected to have a big role in Alabama’s running game in 2015. He was a member of the 2014 recruiting class, but did not enroll until January of this year. 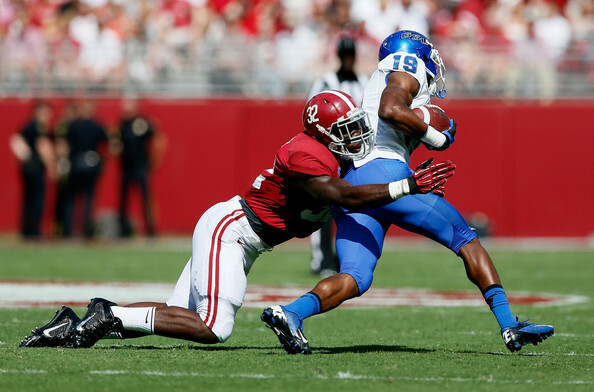 Scarbrough’s injury leaves some sudden depth issues for Alabama at the running back position. Altee Tenpenny transferred at the end of last season and Tyren Jones was suspended and dismissed earlier this week. 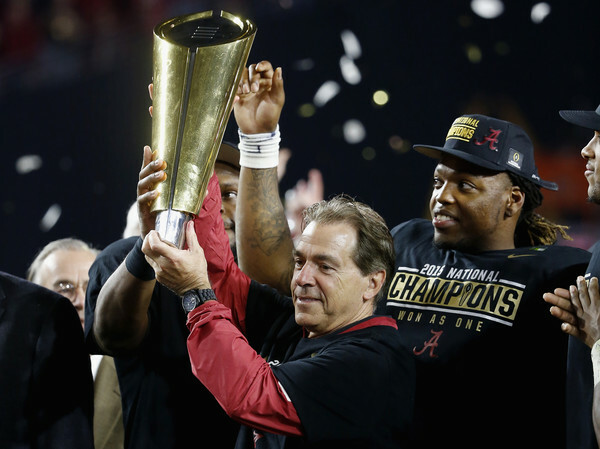 Alabama does return Derrick Henry and Kenyan Drake. Henry was the top rusher with 990 yards and 11 touchdowns while Drake 112 yards and 4 touchdowns.